Writing research papers. Yawn, right? Writing research papers as a 6th or 7th grader. Double yawn with a side of whining and complaining, right? Adam and Kaden learned how to write research papers last year and had to write about one a month. They enjoy doing the research but organizing it into a paper is tough and a bit overwhelming. I love writing papers, something about the structure of the five paragraph essay appeals to me, but I remember learning how to write papers and feeling like a deer in headlights when assignments were given. Years of practice certainly upped my comfort with the papers, not that middle school kids are going to believe that. 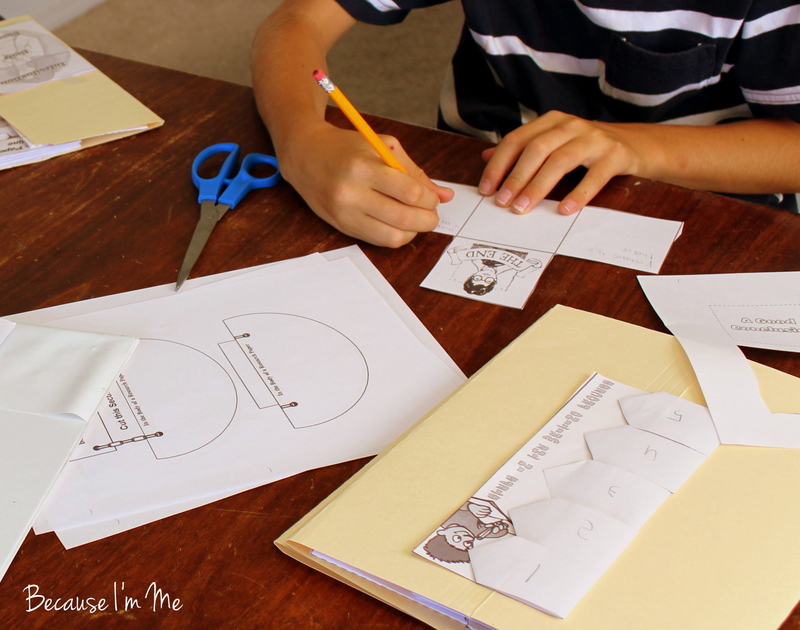 Teachers and Homeschool parents love our high-interest, hands-on curriculum including Lapbook Project Packs, Notebooking Packs and Thematic Unit Study Packs. With this unit study you will be able to teach your middle and high school classroom how to write a research paper. 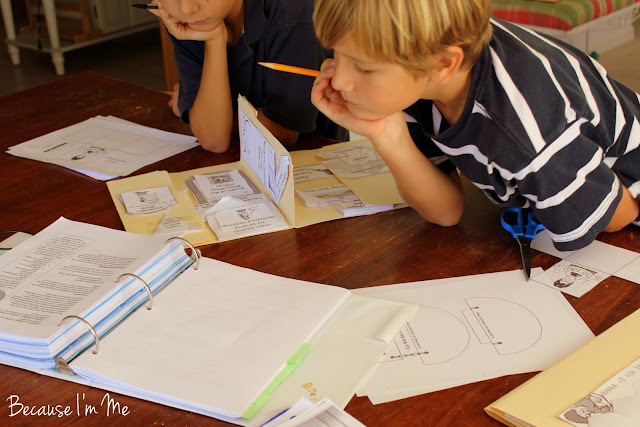 Teach your student about the writing process, researching topics, taking notes, and completing a research paper. Make your lesson planning easy with the How to Write a Research Paper Curriculum from In the Hands of a Child. This pack includes a 9-day Planning Guide, Related Reading List, 25 Hands-On Activities, a 13-page Research Guide, and an Answer Key. 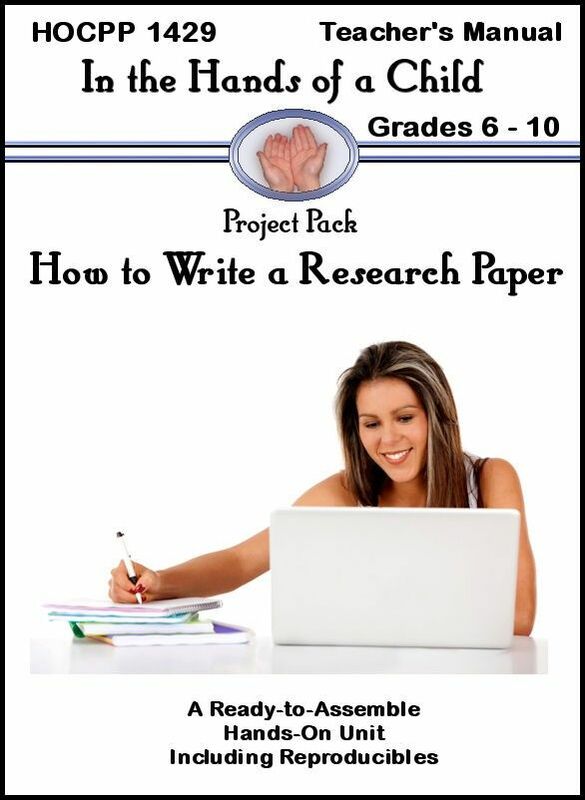 The downloadable "Project Pack" guides the student through the process of writing a research paper while creating a "lapbook". The Project Pack contains the lessons, planning guide, activity instructions, reproducibles needed for the lessons and activities, and an answer key. A lapbook is crafted from file folders and paper cut, folded, and glued in various ways. 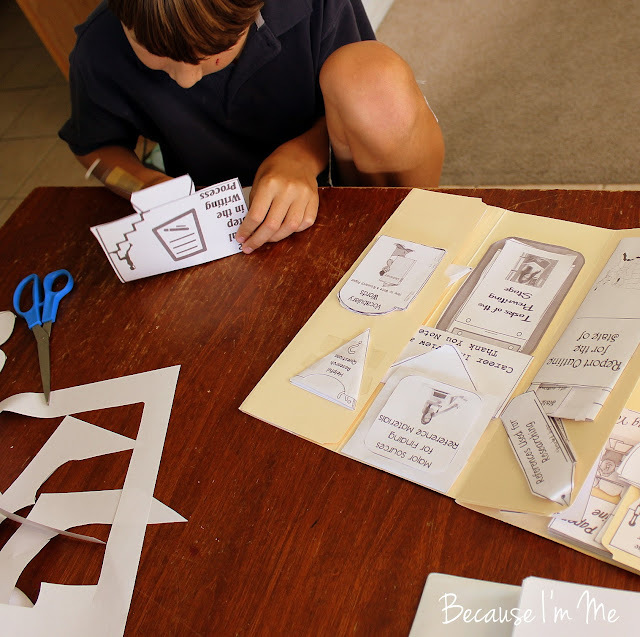 The premise of the Project Pack/Lapbook is that students learn better by doing and the hands-on style puts learning in their hands and thus improves learning. Downloading the Project Pack was very simple and easy. Everything arrives in one printable file. Once printed I labeled the various sections - Planning Guide, Related Reading, Activity Instructions, etc. with tabs so it was easier to move back and forth between sections. A few things I'd have liked to see are numbered pages - the table of contents directs the user to certain pages but they aren't labeled and, and this is just me and my personal preference, I'd be much happier if the downloadable pages, instructions, "how to" pictures, and lessons for the day were all together. Each days lesson only took a few minutes and the handwork for the day took about 15 minutes. The boys attention was held throughout the unit study and they looked forward to doing it each day. I liked that the Project Pack broke down writing a paper into five different, separate steps and clearly explained gathering information, writing an outline, and writing a thesis statement. Breaking it down makes the entire process much less daunting. I did not feel that enough attention was given to the writing phase of the paper. There were some wonderful ideas given for organizing the body paragraphs, but not much about how to actually write the body paragraphs. If some sample paragraphs had been included that would have been very helpful to the boys, they couldn't visualize what they were being told to do. The project pack itself had a good introduction, thesis statement, and conclusion which I shared as examples with the boys. The final assignment in the Project Pack is to write a research paper. 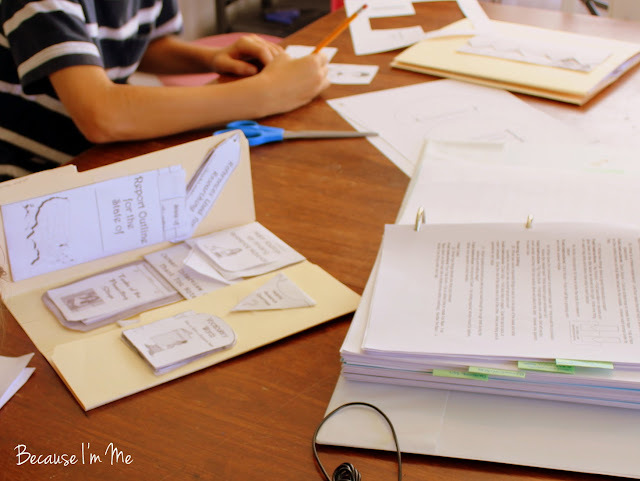 I initially left them with just their completed lapbooks and the Project Pack lessons to work from, but it really wasn't enough, on it's own, to write a solid paper - though they did use it for their information gathering and outlines. I pulled out the notes and drawings I'd written for them last year about writing a research paper. That information, supplemented by the Project Pack information, did help them to create a solid paper with more confidence than they'd had before. 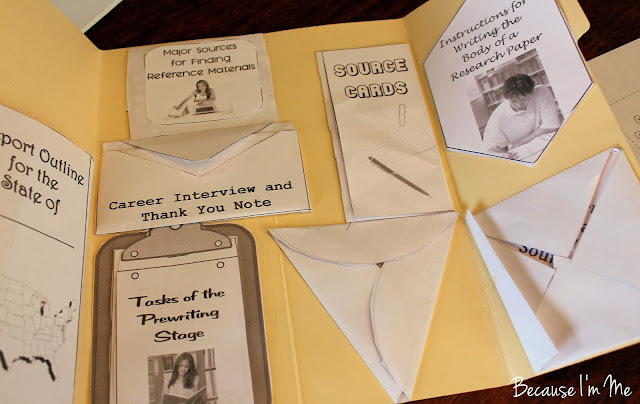 The How to Write a Research Paper Project Curriculum is written for 6th to 10th graders, my 6th and 7th grader enjoyed it and it seemed age appropriate for them. Adam felt it was fun and he learned a lot about research papers. 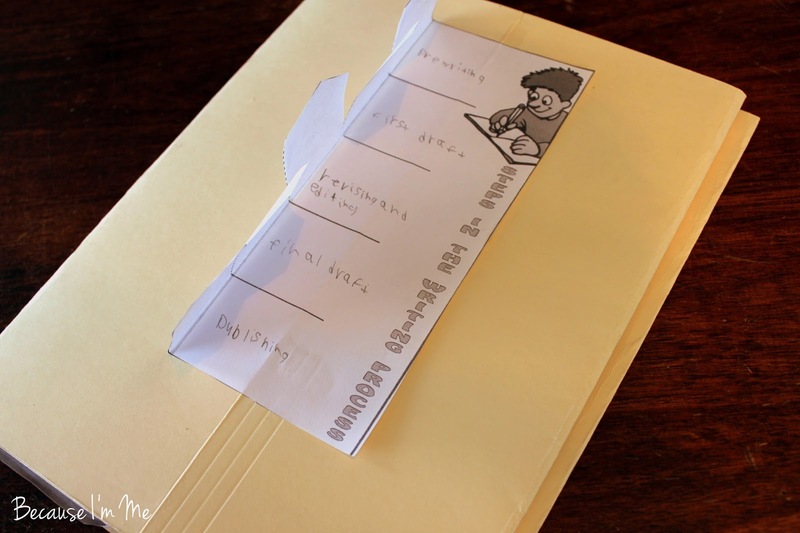 He liked learning a new way of learning (the lapbook). Kaden said it was fun, writing a research paper didn't feel "that bad", and he liked cutting paper. Adam felt he'd remember what he learned, Kaden wasn't sure. 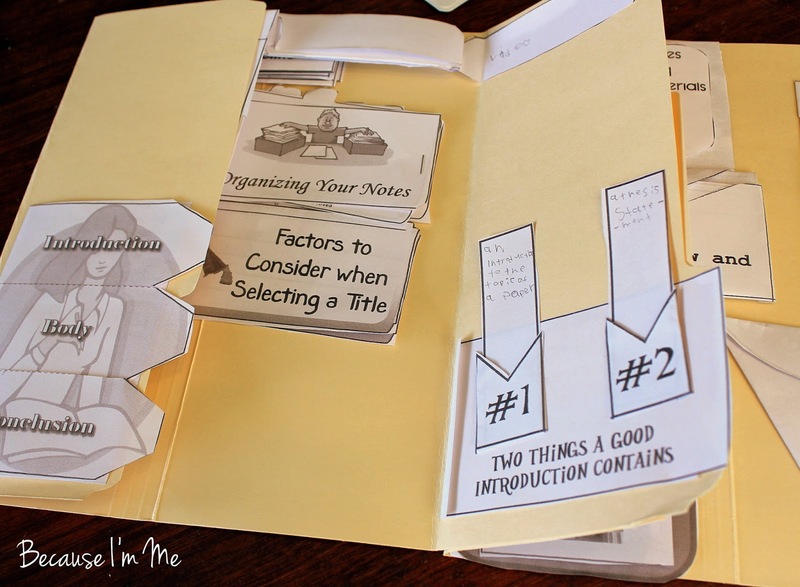 If you've got kiddos entering middle or high school I think this Project Pack can be a solid addition to your writing arsenal, an asset when teaching thesis statements, introductions, researching and citing works, outlining, and conclusion writing. How to Write a Research Paper is available at In the Hands of a Child. It is currently on sale for $5, with a regular price of $12. Edited to add 8/22/13: I just discovered that *all* their lapbooks are on sale for around $5, most down from $12, for the rest of August, and that this sale doesn't happen very often. I shopped and found some great Project Packs for the boys and even more for River. Seriously, head on over there and check them out. I did read the other crew reviews first for products I was considering, which helped narrow down my decisions (but not much, it was hard to not overbuy). Let me know what catches your eye, I'd like to pick up a few more for Adam and Kaden. I think I might get this for Mason...Let's plan a day to get together! Nice Read!!!! There are various ways through which you can write a research paper as well as pay to write research paper. So follow all things and get the advantages.